Every 20 minutes, somebody in the world gets to know that they have a blood-related disorder or disease. For many of them, the only hope of recovery is stem cell transplant. For the transplant, the blood stem cells are often recruited from someone unknown, a volunteer donor. However, one in ten patients does not find a donor. Today worldwide more than 50,000 transplants are carried out annually and are increasing each year. In order to meet the continual requirement of stem cells, there is necessity for more volunteers. The donors, a non-patient group invite themselves into medical process of blood stem cell donation. For them, the donation journey isn’t an easy process. First of all, becoming a potential match to a patient happens in rare cases. In comparison to other donation procedures, this process is quite challenging and complicated; donor goes through a lot of tedious and time consuming steps over ambiguous time frame. They have lot of individual responsibility, involves considerable commitment and have to connect with a lot of stakeholders involved in the process performing in silos across different geographies. These stakeholders involve NGO, healthcare professionals, family members and in some cases, patients too. The DONOR SPACE, a framework focuses on creating a cohesive, end-to-end experience, optimising it for all the stakeholders rather than focusing only on one aspect of the donation process. It revolves around how the young millennials can be made aware, engaged and feel acknowledged for their efforts throughout. The service represented is through three key touch points. Firstly, DONOR FLOCK creates awareness and deeper community engagement around the topic. These information kiosk are strategically placed in public spaces where people can grab a swab kit to register themselves. It supports in making donor registration more convenient and frequent, helping in cutting administration cost. 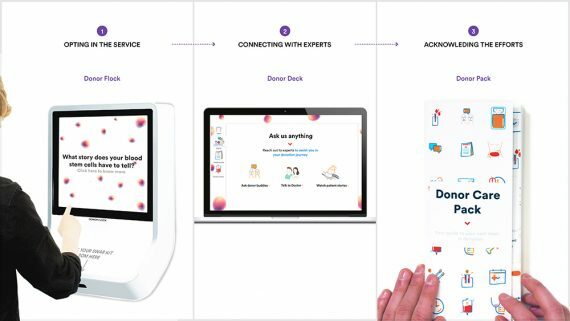 Later, once a donor is a potential match to a patient, DONOR DECK; a collaborative platform assists them in navigating the entire process, eliminating ambiguity. It streamline tasks for everyone, reducing burden of travel and overseas cost for people involved, also providing a support system for their emotional well-being. It connects them to healthcare professionals, NGO, and pool of donors around the world, currently which happens through phone calls. When a potential donor becomes exact match to the patient, DONOR PACK is delivered with injections making them feel special and appreciated. The project is developed in collaboration with DKMS Germany, A non-profit advocacy group which works to raise awareness of the need for donors, nurses of haematology department at Umeȧ University hospital, Sweden as well as patients and donors from around the world. It is based on user research and analysis, user journey, stakeholder mapping, user testing, value proposition and future testing recommendations. Visual language is taken into account to make process inviting for the donors. Focus has been PBSC (Peripheral blood stemcell) donation because of its current frequent occurrence than other donation procedures. To communicate the concept, a fictional youtube influencer takes viewers through his donation journey in the video.